Have you ever manifested something by ‘accident’ without knowing it? Just by your intention, emotion and thoughts? This is my view from my new apartment in Brisbane. These are the events that lead me here, but not by ‘accident’. You can do this too…all you need to do is to be open to the idea and have a little trust and faith. What do you do when you are on a mission to find a new home? Like finding your Prince Charming, you may have to kiss a few toads before finding ‘the one’. So I looked at many properties and in fact the very first one I saw with a dear friend ended up being the apartment block, but not the right apartment, but I didn’t know it at the time because the timing wasn’t right according to the Universe. I wasn’t quite in a position to move. So I kept looking…and looking…and looking. Can you relate to this in some aspect of your life? Doesn’t have to be solely relating to apartment hunting. Think about it for a moment. When have you ignored your intuition/gut feelings and allowed your head to get in the way? One day I was about to call an agent to look at a particular apartment. Although when I actually dialled the number, it wasn’t the place I thought I was calling, and I dialled it straight from a link on the web on my phone! It went through to the place I am now living in! Synchronicity and the Universe at work…so I thought to myself (as you do), time to follow the trail and see where it leads, there is a reason this has happened. When I look back, the ad for the apartment where I ended up kept ‘appearing’ in front of me, but I ignored it as I thought it was the result of advanced google marketing at work. I let my head get in the way. I am only human! I checked it out, and found that the apartment I was shown was on the eighth floor with water views of the Brisbane River, surrounded by beautiful parks, open space, privacy and a beautiful view of the city at night. To top it all off, it was the price within my budget I asked for and a new apartment with a private balcony which has become my favourite space to relax and work in. Oh and I even have a small beach! I asked the Universe to give me a sign that this place is where I was meant to be (to be sure to be sure). As I was driving to my mum’s which I have done quite a lot, the same route as I turned into her street, I ‘happened’ to glance up and look at an apartment block. The words on the building were the name of my street, and it is an unusual spelling so what are the chances right? That really made my day. I smiled with a huge grin and thanked the Universe and my Guides. Where would YOU like to live? What would you like to manifest? Create a plan, put out the request, trust, let it go and follow the synchronistic trail. The Universe has your back! 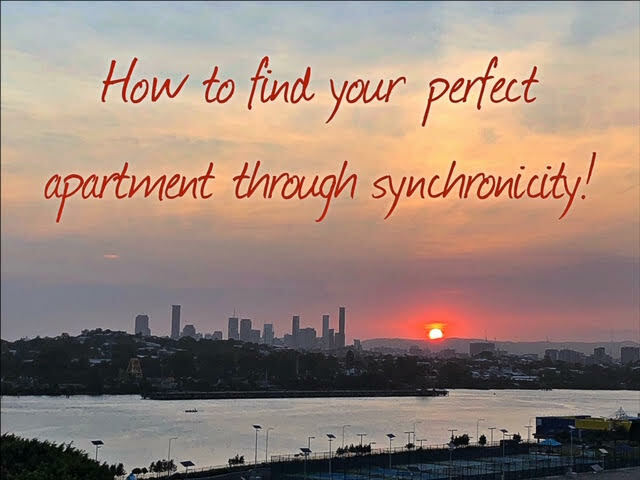 WHAT'S YOUR STORY OF SYNCHRONICITY? Why not share it here?